Who is the cutest baby in your family. 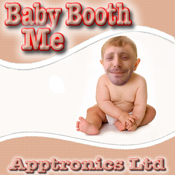 Everyone can take their turn to be the cutest baby in this fun app , Baby Booth Me. You can use your images in your photo library or take a picture with your iphone camera and insert your face into the Baby pictures.